I grew up in a time when our mantra was “Do your own thing”. We all believed we had the right to live our lives whatever way we wanted. Ironically, though we lived our lives differently than our parents, we all pretty much followed the same rebellious route. I thought I was such an individual when I was just another wild child from the seventies. But something happened this year when I turned sixty. I started to really not care how others saw me. I began to do what actually made me happy or comfortable. Case in point: I hate wearing shoes. I may have been born a city gal but I have a hillbilly heart. It’s the end of October. The temperature was in the 40’s this morning. Everyone has on their fall footwear i.e., boots. But I wanted to feel the air on my toes. So I was the only one on the train platform today wearing sandals. A small act of defiance but one that made me feel I’d struck a blow for the cause. 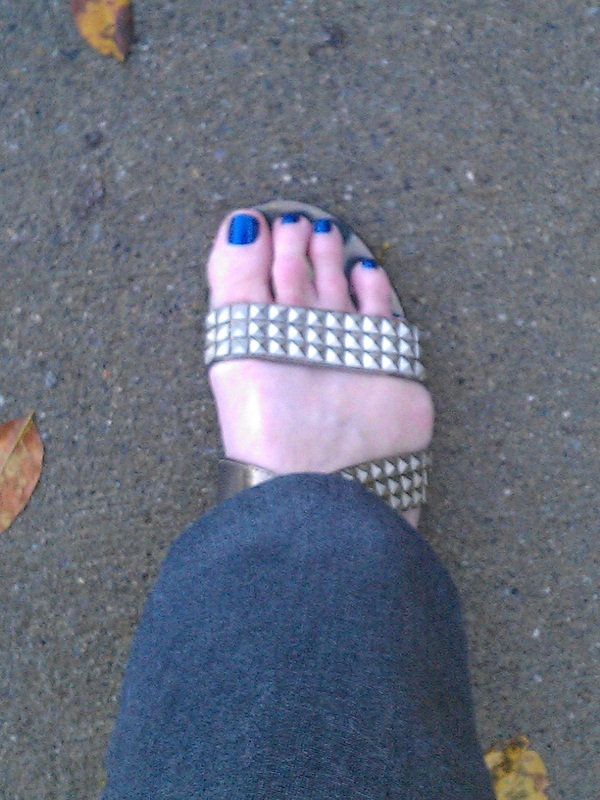 This entry was posted in Aging, Commute, Daily Life and tagged aging, freedom, toes. Bookmark the permalink.